I wasn’t sure when my first opportunity would come to try my hand at Spicy San Francisco, but with two friends from Mexico in town–one who had never tried Thai food before–I had curry on the mind. What I didn’t expect from this unassuming restaurant awning and ubiquitous name was to fall in love with a new variation of perhaps my favorite Thai dish. Unfortunately, someone else ordered panang curry so I scrambled for a second option. And that’s when I saw it. It had peanuts; it was red; it resembled satay; it was something I had never tried before. 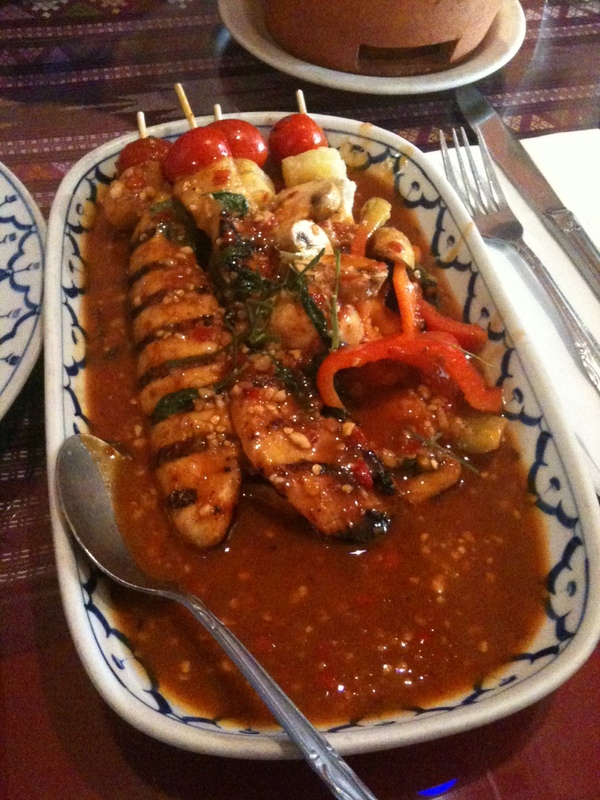 In other words, Panan Gai Yarng, please, Thai Hot! My new favorite Thai dish! My mouth is watering again. Click to make it bigger! I ordered it with rice, although I suppose it could have been eaten like satay (off the skewers). I was most surprised by how well the pineapples and cherry tomatoes worked with the heat. When I needed a ‘break’–besides water–I ate one of those. The sheer amount of ground peanuts was also a welcome bonus–the curry was practically mixed with peanut sauce and made more syrupy while toning down the coconut element. The chicken was slightly blackened–another neat departure from traditional curry. The dish was near perfection, as a -1 Z-Scale Rating is only underspiced to a minimal degree. I could have taken a bit more heat before it became uncomfortable, and I think other spice-hounds would agree. Just one bite does not cause much initial burn, and after 30 seconds those with a similar spice passion will be back to normal. In order to really push the heat of the dish, I had to speed up my eating pace and really cover my chicken and rice with spoonfuls of the curry, (which was thicker than usual–closer to a sauce). The heat was cumulative, and it was only after eating quicker than normal and then spooning the sauce directly (after finishing everything else) was I able to make myself somewhat uncomfortable. The ensuing burn in my mouth lasted a good five minutes, then fading to a pleasant feeling. If eaten at a regular pace, without main-lining the sauce, this panang gai yarng should hover around a -1 Z-Scale Rating for most of you. As always with Thai restaurants–if the heat gets to be too much, Thai iced tea is the perfect solution. Bonus: A google of “panang gai yarng” suggests that this dish is hard to find outside of San Francisco.